“Dedicated readers of space opera expecting planet-busting shenanigans might be slightly perplexed by the genteel opening section which takes its time in establishing a society where rules and etiquette are everything, as well as exploring the tangled history of the characters. Absorbing and entertaining, with some effective hard science and an edge of relationship-based humour that Jane Austen would have appreciated, it’s a careful opening but one that gives little sign of any promised intergalactic conflict. “Walter Jon Williams hasn’t sold out — he’d much rather subvert from within.” — Faren Miller, LOCUS. Weaponers, Martinez thought. Engineers. And the constabulary. If you were to take a ship by boarding, he thought, the first thing you’d want to secure would be the missiles with their lethal antimatter warheads, and you’d need weaponers for that. Engineers would be required to secure the engines, which used dangerous antimatter as fuel and whose blazing torch could itself be used as a weapon. Officers would be needed in Command and Auxiliary Command. And armed military cops would make the whole job all that much easier. A warning bell began to chime in Martinez’ mind. He zoomed the security cameras on the Naxid parties and began to record the feed . . .
Martinez followed the Naxid parties with the security cameras until their mission was completed. The enlisted returned to their individual ships, but the officers went to The Majesty of the Praxis, Fleet Commander Fanaghee’s flagship, presumably to report. Martinez thought for a long, somber moment as he stared at the multiple displays, then saved all the recordings and the translations into his personal file. He wiped the screens, thought for another moment, and then triggered his sleeve display. Martinez rose from his seat and glanced around Command. Cadet Vonderheydte was at the position that monitored ship’s systems, bent over a display and probably censoring mail. Signaler/2nd Blanchard, in Martinez’ own division, daydreamed over the communications board. Otherwise Command was empty. Martinez pushed his displays up until they clicked into place and stepped out of the locked command cage. He made his way to the exit and then hesitated– Vonderheydte had kept watches before, but usually Koslowski or Martinez had backed him up with an experienced warrant officer. Martinez went down the central belt elevator to Auxiliary Command, the armored battle station aft intended for use if Command was destroyed by an enemy or in the hands of mutineers. Here Martinez waited for Alikhan’s arrival, then opened Auxiliary Command with his lieutenant’s key. The armored door rolled shut behind them as the lights automatically came on. Auxiliary Command was smaller than Command, the stations more cramped and the gimbaled chairs placed closer together. Nevertheless the metal cages gleamed, and the scent of polish wafted on the breeze: the place had been carefully sleekened and burnished just that morning. Alikhan eased himself into the couch and lowered the displays until they locked in front of him. Martinez opened his private files and showed Alikhan the Naxid parties marching along the rows of ships, the officers, weaponers, engineers, and constables. He showed the translations the program had made, but offered no comment on them. “What are your conclusions?” Martinez asked. Alikhan stared at the displays, the deep lines of his face set in a frown. “I don’t like to speculate on such things, my lord,” he said. Alikhan’s mouth worked beneath his spreading mustachios. And then he sighed, and gave a slow nod. Relief trickled through Martinez’s veins. He wasn’t alone in this madness, he had an ally. Martinez felt cold fingers caress his spine. This was a factor he hadn’t considered. Alikhan’s expression did not change. “The captain may not be . . . receptive,” he ventured. Martinez felt a sudden, angry urge to leap from the acceleration couch and pace around the room. For Martinez, planning and motion were best performed simultaneously. But the room was too crowded with the close-packed acceleration cages, and so he settled for savagely wiping the screen of Naxids. Despair clawed at Martinez’ heart as he stared hopelessly across the small armored room. He couldn’t even use coded communications: all the Second Fleet had the same codes in common, and Fanaghee or her minions would be able to read anything he tried to send. Martinez blanked the screen, unlocked the displays, and swung them up and out of the way. A strong sense of relief swept through him: he was accomplishing something, working against the threat he’d knew existed. He bounded to his feet like a man escaping prison. And then he remembered that his next task was to speak to the captain, and again his heart sank. Irrational hope blazed in Martinez’ heart. Tarafah and the rest of the team had just returned from their day’s practice, and the elcap, the lieutenants Koslowski and Garcia, and the trainer, Weaponer/1st Mancini, were settling down to a meal at the captain’s table. They were all still in their sweats, with Corona’s blazing badge on their breasts, and smelled of exercise and the outdoors. The captain’s table was scattered with bottles and cold dishes as well as papers and diagrams of plays. And now Tarafah actually wanted to speak to him. Martinez had worried about being resented for intruding on the captain’s time, but it seemed he wasn’t entirely out of the captain’s thoughts. “Yes, lord elcap?” he answered. Martinez was surprised. He had long ago assigned his spare-servant scheme to the realm of unsuccessful ploys. “Of course, lord elcap,” he said. Till he can be promoted to Specialist/1st in some poor fool’s division, Martinez thought. Let’s hope it isn’t mine. Martinez sat at the end of the polished mahogany table while the captain’s steward provided him a place setting and poured him a glass of dark ale from the pitcher in the center of the table. The others were in a exuberant mood: the day’s practice must have gone well. Martinez tried not to fidget with his silverware. Tarafah beamed while the others toasted him. Martinez took a breath. Certainly there would never be a better moment. “Show us?” Tarafah bent over his plate again. “May I use the display here?” Without waiting for permission Martinez reached over the pink head of the plump, bald Mancini and touched the control of the wall screen. He activated his own sleeve display and slaved the wall screen to it. He went through the evidence piece by piece, just as he had with Alikhan. The others ate in silence as he spoke, Mancini and Garcia occasionally craning around to view the display behind them. At the end, with the screen frozen on a Naxid officer flashing the symbol for target , Martinez turned to the captain. Garcia spoke hesitantly. “They’re obviously rehearsing something.”. “And it’s a maneuver that requires weaponers, engineers, and the constabulary,” Martinez said. To prevent his hands from trembling with eagerness and frustration, Martinez clamped them on the butter-smooth edge of the table and squeezed. ” They’d never spoil the football,” Mancini proclaimed, and smacked his lips as he drank his ale. Martinez suppressed the impulse to hurl his glass at his captain’s face. Martinez drank with the others, as despairing, unvoiced shrieks echoed one after another in his skull. Martinez didn’t manage to eat much of his dinner. When the elcap proposed another review of the videos of Beijing’s game, Martinez excused himself and made his way to his cabin. Once there, he sent messages to the other officers he knew on station, asking if they’d care to meet him in one of the bars on the station. Salzman didn’t reply, Ming sent his regrets, Aragon said that he was participating in the wushu tournament in the Festival of Sport and was making an early night of it. Aidepone was likewise preparing for tomorrow’s game of fatugui, and only Mukerji accepted. Viewing the transmission, with its sonic interference, Martinez knew that Mukerji was already in a bar. Martinez joined him in the Murder Hole, a dark, nebulous, and noisy place, with ear-shattering music and dancing. Mukerji bought three rounds of drinks while Martinez showed Mukerji the Naxid maneuvers on his sleeve display, and then explained his theory. Martinez excused himself and made his way out onto the ring station with whisky fumes swirling through his head. Perhaps he was mad, he thought. No other officer credited his theory about the Naxids, and perhaps they’d been right about the absurdity of his premise. 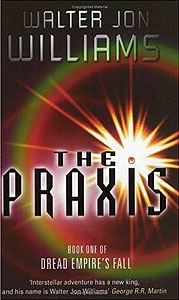 It made no sense why the most obedient and orthodox species under the Praxis suddenly turn rogue. He admitted to himself that he didn’t like Naxids and never had. It was, he likewise admitted, an irrational prejudice. Naxids had always made him uneasy, unlike the other species united beneath the Praxis. Perhaps he had let his bias run in advance of the facts. He thought again of those parties marching up and down the ring station’s broad avenue, and at the thought a chill certainty went through his frame. No. He was right. The Naxids were going to board the ship. It was possible there was some rational explanation for it other than a rising, some reason that hadn’t occurred to him, but the boarding would happen. And if the boarding were to be prevented, it would be Martinez who would prevent it. Martinez returned to his cabin aboard Corona and called Alikhan. Alikhan didn’t seem surprised. “I have spoken to the master engineer,” he said. “Maheshwari agrees with your lordship.” Spoken carefully, in case of eavesdroppers. Martinez sighed. Maheshwari was something, at least. The orange end transmission symbol appeared on Martinez’ sleeve display, and he blanked it. Fully aware that this was the last time he might ever do these things, Martinez took off his clothes, hung them neatly in his tiny closet, and prepared for bed. Plans for saving Corona eddied through his head, all fog and futility. Sorensen to Villa to Yamana to Sorensen to Digby, he thought. Martinez, with most of Corona’s crew, stood on the station rim outside the airlock and cheered and clapped as Tarafah led Corona’s team out of the ship. Tarafah, immaculate in white sweats with Corona’s blazon on his chest and his lieutenant-captain’s shoulder boards pinned on, grinned and waved as if he were jogging into a stadium filled with ten thousand fans. Koslowski followed at the head of the players. ” Corona! Corona! ” the crew chanted. Martinez pounded his big hands together till they were sore. The team jogged away to the rim train station that would take them to the skyhook terminal, and were followed by the waddling figured of their trainer, Mancini. Lieutenant Garcia, in undress mourning whites, whooped and waved her cap over her head. Shouting, most of the crew poured after the team, leaving behind the cadets condemned to spend the day aboard, and Dietrich and his partner Hong, both looking depressed at having to play military constable while the rest of the crew was off on a lark. Served them right for being large and handsome, Martinez thought. Since the airlock guards were the members of Corona’s crew most often seen by outsiders, Tarafah chose them for their imposing appearance rather than for any skill at policing. Lieutenant Garcia herself remained behind, cheering and clapping as the crew pounded after their team. Then she turned to Martinez and stepped up to him. Martinez glanced at his half-opened hand, saw Garcia’s second lieutenant’s key, and felt his mouth go dry. He shut his fist on the key. Martinez managed a nod. “Thank you,” he said. Martinez stared into the dark eyes. His nerves wailed like violin strings tuned to the breaking point. “I understand,” he said. Garcia gave a quick, nervous nod, then turned and ran after her crew. Martinez let his breath out slowly as he watched Fleet personnel stream past along the rim. They laughed and shouted, carrying banners and signs, their officers striding with them, happy to let them have fun. It was their first holiday since the period of mourning began, and they were ready for an delirious good time, already drunk on freedom and anticipation. He’d be laughed at if he was lucky. If he was unlucky, he’d be hit on the head by the constables and dragged off to jail. Blow everything, he thought again. There were thousands of personnel on the ships and the ring station, and millions of civilians, all to be vaporized or blown to bits– but only if he was right about the Naxid rising. If his fears were justified, everything was already lost. Except maybe Corona . Maybe he could save his ship. He put Garcia’s key in his pocket, then turned to face the airlock. Dietrich and Hong stood there, stiff-spined in the presence of officers, along with Warrant Officer First Class Saavedra, a middle-aged, mustachio’d man who had double duty as Corona’s secretary and supply officer, and Cadet Kelly, a lanky, clumsy pinnace pilot in charge of the weapons department in the absence of the drunken master weaponer. “Kelly. Saavedra. After you.” Martinez made shooing motions with his arms, and the two turned obediently and headed into the airlock. Martinez began to follow, then paused by the two constables. Dietrich and Hong braced as they detected his inspection. “Yes, lord lieutenant,” the two chorused, eyes forward. The two blinked in surprise. “Very good, lord lieutenant,” Dietrich said. “Yes, lord lieutenant,” the two chorused again, though Martinez could see more of their eyewhites than he should, a sure indication they thought the third lieutenant was out of his mind..
“Buena Vista,” Martinez repeated again. The name of the house on Laredo where he had been born, the name given by his romantic mother in words that belonged to an antique Terran language no longer spoken, and read only by scholars. He could see, drawn through the ether between the two constables in invisible letters, the conviction that Martinez was insane. There were four doors between Martinez and the interior of Corona, two at the rim airlock, where Dietrich and Hong stood guard, and two on the frigate’s bow lock, with the docking tube in between. Martinez moved along this series of barriers and entered his kingdom. A kingdom with nineteen subjects, most present in obedience to the regulation that required every vessel in commission to carry sufficient crew aboard, even in dock, in case an emergency require that the ship be maneuvered. A dozen of those aboard were intended to work the ship, and the rest consisted of the two constables and a full kitchen staff preparing a huge celebratory meal in anticipation of Corona’s victory. Martinez let himself into the ship’s small armory with his lieutenant’s key, then summoned Alikhan and Maheshwari. While he waited he signed out a sidearm and strapped the weapon on its constable-red belt around his waist. He signed two more out to Alikhan and Maheshwari, then handed Alikhan pistol to him as he arrived, along with a red constable’s armband and helmet. “Very good, my lord.” He looked at the armory datapad, then signed for his weapon and pressed his thumb to the weapon’s ID scanner..
“No.” Breaking into the premiere’s safe in search of his key was, among other things, a capital crime, and if he were discovered it would be a race between the Criminal Investigation Division and the Legion of Diligence to see who would kill him first. Martinez wasn’t quite willing to commit himself to the executioner’s garotte just yet. Maheshwari arrived and braced to the salute. He was a small, mahogany-skinned man, with crinkly hair gone grey and a pointed beard and mustachios dyed a spectacular flavor of red.. Martinez handed him a sidearm. “I hope this won’t be necessary,” he said. As possible was the key here. No drill was going to be normal on the Festival of Sport. Dropping water, air, electrical, and data connections to the ring station would be the station’s first warning if Corona left its berth unexpectedly. Martinez wanted to delay the warning as far as he could. At least he was confident that, if necessary, he could leave his berth when he wanted to, whether the engines were ready or not. Six hundred and forty-one years ago, a raging fire had broken out in Ring Command on Zanshaa’s ring station, subsequently spreading to seven berthed ships, all destroyed along with their crews. The ships could not unberth, or even close their airlock doors, without permission from Ring Command, which by then had been gutted by fire. Since then, regulations had insisted that a ship under threat could unberth without permission, and had complete control of its airlock doors. Martinez could get Corona out of its berth, the only question being whether the other warships would permit her to survive past that point. Martinez did his best to pretend that he had his imperturbable, omnipotent officer’s face on, and ventured to give the master engineer a confident smile. The engineer braced in salute and returned to Engine Control. Martinez locked the armory and went to the central belt elevator that would take him to Command, then hesitated, one hand on the wide belt that held his sidearm and stun baton.. If he walked into Command wearing this thing everyone would know him insane. If the Naxids did nothing, or if what they did had a rational explanation, then the entire crew would know by the end of the day. He’d become a laughing stock. He stood in the hatch and heard the laughter in his mind, laughter ringing down the years as long as he remained in the service. If he were wrong he could expect nothing less. Everything Fanaghee and Kulukraf were doing could have an innocent explanation– well, not innocent exactly, but at least rational . If he had missed that, if the Naxids were doing anything else but a rising, he would never hear the end of it. The story would become one of those Fleet legends that would follow a person for his entire career, like the story of Squadron Commander Rafi ordering the cadets to bind and beat him. The endless belt of the central elevator rustled past. Suddenly he wanted very much to return to the weapons locker, check his pistol back in, and go to the wardroom to watch the game on video and cheer on Corona’s team. The hell with it, he thought. He was already a laughing stock to most of the crew. He put a foot on the next descending rung, took a handhold onto the rung above, and stepped into the central trunk corridor. He stepped off two decks below, and immediately saw Zhou, the brawler he’d released from arrest two days before, who was polishing the silverware in the officer’s mess, across the corridor from Command. Wonderful, Martinez thought. He had Zhou, Ahmet, and Knadjian in his crew, as well as every other miscreant that the captain had condemned to labor instead of the games. Zhou, polishing away, gave Martinez a dubious look from his blackened eyes, which widened when he saw the pistol belt. Martinez gave a curt nod and walked into command. “I am in Command,” he announced. “The officer of the watch is in Command.” Cadet Vonderheydte agreed, speaking from his position at the Comm board. The scent of coffee, wafting from the cup he’d propped near one hand, whispered invitingly in the room. Martinez stepped into the locked captain’s cage. “Status?” he asked. “Thank you, Vonderheydte.” He turned his back on the cadet and sat in the captain’s chair. Cushions sighed beneath his weight, and he adjusted the pistol to a more comfortable position, then reached over his head and drew down the captain’s displays until they locked in front of him. He set one display to the security camera. Crewmen were still streaming past the airlock toward the rim rail stop. Nothing untoward was visible, but then Martinez didn’t expect anything for a few hours yet, not until the crews had descended to the planet’s surface and all the remainder were distracted by the sports.. He settled back in his chair. “We’ll be having an engine drill presently,” he said, and then listened to the profound, astonished silence that followed his words. Sorensen to Villa to Yamana to Sorensen to Digby– and goal. Martinez heard Vonderheydte give a shout as the ball shot past Beijing’s goalkeeper and into the net. Warrant Officer/2nd Mabumba punched the air with a fist. He sat at the Engineering station, and in his excitement at Corona’s second goal had forgotten to be resentful of Martinez for the engine drill that put Mabumba in Command instead of the warrant officer’s lounge, where he could have watched the game in comfort, and with a glass of beer by his hand. Maheshwari in Engine Control was holding the engine countdown at five minutes. Martinez had doubtless won the enduring love of the entire engineering division for calling the drill on a sports holiday, and keeping them at their stations. Martinez had left Command only once, to help Alikhan bring food, coffee, and comfort to the two guards at the outside airlock, where Martinez had made it clear to Dietrich and Hong that any orders from Alikhan were to be treated as if they were orders from Martinez himself. Clearly, the silent faces of the sentries suggested, there was more than one madman aboard the ship. Next Martinez tried to see what he could do about sending alarms to other elements of the Fleet, perhaps to Zanshaa. A check with data on file at the Exploration Service, which crewed and maintained the wormhole stations that stitched the empire together with communications lasers that pulsed messages and data from one system to another, showed that there was no chance of getting word outside the Magaria system. In the previous few months, on a leisurely schedule, the crews of each station had been replaced– with Naxids. Another possibility existed. There were civilian ships in the system, outbound. He could send a message to each of these, and hope that at least some information escaped the system. He checked the navigation plots and discovered that there were sixteen civilian ships in the Magaria system. He checked their registration, and after discounting the three large inbound transports belonging to a corporation called Premiere Axiom, based on the Naxid homeworld of Naxas, produced a list of ships to which he might appeal. He’d tell them when the time came. And he still had ground-line communication to other ships berthed in the Fleet dockyard. He might be able to save some of them yet. Another of Martinez’ displays shifted through a succession of other security monitors, particularly those on the Naxid stretch of the ring station. The Fleet enclave was nearly deserted: everyone, even the civilian workers, had been given tickets to the Festival of Sport and a day off. The only living presence in the Fleet areas were the two guards posted by every airlock. A third display showed the football match between the Coronas and the Beijings. Tarafah’s offensive strategy had thus far scored two goals and held the opposition scoreless. Martinez had to admire his captain’s ability as a strategist– he was truly superb and inspiring sports tactician. A fourth, smaller display scrolled slowly between the other games being played at the same time. His friend Aragon of the Declaratio n had won his wushu match with a joint lock in the second round, but Aidepone’s team from the Utgu wasn’t faring very well in their game of fatugui, a game involving a large ovoid ball being flung across a field by what looked like giant teaspoons held in the matchstick arms of the Daimong players. Two of Aidepone’s side had been declared dead, in fatugui a temporary condition, but their opponents now had the advantage of numbers and had scored several points, and their own team kept stumbling over them. Senior Fleet Commander Fanaghee was enthroned, with Kulukraf and others of her senior staff, in the stadium where two champion Naxid teams were deeply involved in lighumane, a game of position and movement that seemed like an unlikely combination of chess and rugby football– at one moment players carrying large white or black placards were participating in diabolically subtle maneuvers on a green field, and then all periodically dissolved into riot and violence. The camera frequently returned to Fanaghee, as if to demonstrate to everyone that she was here watching sport instead of, say, conspiring at mutiny aboard the Majesty. All these displays, however, were little more than a distraction to Martinez. A fifth, central display was open to a navigation plot. Martinez had been trying to find an escape route for Corona once he got her out of dock, and the possibilities weren’t promising. The direct wormhole route to Zanshaa was blocked by the cruiser Judge Kybiq, which had departed the station en route to Zanshaa three days earlier. Other than Zanshaa, the nearest Fleet concentration was the Fourth Fleet headquarters at Felarus, but Fanaghee had cleverly blocked that as well, with the heavy cruiser Bombardment of Turmag , shaking down after a period of refit. The refit, Martinez suspected, had been timed very precisely in order to provide Fanaghee an excuse to order the cruiser out of dock. Corona would have to return to Zanshaa the long way round, through Magaria Wormhole Four, then through a series of three other wormholes leading through uninhabitable or sparsely-inhabited systems. It would add twenty to forty days to Corona’s journey, depending on how hard Martinez wanted to push the acceleration. And then Martinez had to cope with the possibility that once he arrived at Zanshaa, he would find that the capital itself might have fallen to the rebels. In that case Martinez could launch whatever missiles he had at Zanshaa’s ring station, he supposed, try to kill whatever enemy ships were there before he was destroyed himself, and then go down marked in history as Nature’s very own fool. His navigation plot was complicated by the fact that he hadn’t any real-world experience as a navigator, only basic training, and that long ago. Martinez double- and triple-checked everything, and leaned heavily on the computer for assistance. He realized he had been staring at his navigation plot for some time without thought, and reached for the communications button to call to the officer’s galley for a flask of coffee, when a movement caught his eye, and a cold chill eddied along his flesh. His second display was automatically flicking through a series of security camera shots from the Naxid part of the ring, and quite suddenly there was movement. A lot of movement, and on every camera. Naxids were pouring off their ships. Whole long columns of them, swarming out of the airlocks four abreast. He scrambled upright on his seat and only caught the yell of alarm that was rose in his throat just in time to keep it from breaking out. I t’s really happening, he thought. “Damn! Damn-damn-damn!” It was Mabumba cursing, and it took Martinez a staggered second to realize that he was lamenting the fact that the Beijings had just scored a goal. Martinez stabbed at the alarm switch and missed– his overexcited thumb overshot the target and skiddered along the smooth metal console surface– and then he then swiped at the switch with his entire hand and managed to shove it over. Furious, urgent bells blared throughout the ship. Mabumba almost jumped out of his chair, and stared at Martinez with wild, disbelieving eyes. Martinez reached for the headset with its earphones, built-in microphones, and virtual reality projectors, put it on his head, and snapped the chin strap shut. He took a moment to get ahold of his leaping nerves, then spoke into the microphone. “Communications,” he prefaced to the computer. “General announcement to ship’s company.” He waited a half-second or so, and then spoke again. He thought about adding the words This is not a drill, but decided that this was not a time to strain the crew’s credulity. He repeated the announcement twice, then shut off the blaring alarm that was making him more nervous than he was already. Alikhan’s miniature face appeared in the display. Martinez began reconfiguring his displays to employ more security cameras and see what the Naxids were up to. Hundreds of Naxids were on the concourse, martialing under their officers and crowding toward the electric Fleet trains that carried personnel and equipment through the Fleet areas of the ring station. The first of the trains began moving as the door to Command rolled open, and Navigator Trainee Diem entered along with Pilot Second Class Eruken. They looked at Martinez with expressions that appeared to combine annoyance with concern for his mental health. “May I ask what’s happening, my lord?” Eruken ventured. Martinez considered alerting the other ships. This would warn the Naxids of his suspicions, but it was too late for them to change their plans now. There was a moment’s pause, and then the shrieks of a huge crowd and the shouts of an overexcited announcer filled the room. Martinez gathered that Goalie Koslowski had just made a brilliant save. The lanky Cadet Kelly, entering at that moment to take her place at the weapons board, gave a cheer. There was a brief susurrus as the channels were switched, and then the game blared on again. But he knew by now that Vonderheydte would find the games on every channel. Martinez could try to shout a warning to the other ships over the crowd and the announcer, but who knew if anyone would be listening? “Ground line, Comm,” he said. Cable data connections to the ring station were still in place. From behind he heard the soft sound of Vonderheydte’s fingertips touching pads on his console. “What’s going on? ” Mabumba murmured, just loud enough for everyone to hear. The others in the control room exchanged glances, clearly bewildered. At that moment Tracy and Clarke, the two sensor operators, arrived in the sudden silence, and ghosted to their places as if struck by a guilty conscience. Nervous energy drummed through Martinez. He didn’t want to wait, he wanted to be in motion along with his ship. He paged Maheshwari. Martinez realized he’d called the master engineer less to alleviate Maheshwari’s nervousness than his own. He had been reaching into the engine room for comfort, for someone who understood, who would make him feel less lonely in his moment of command. It wasn’t helping. “Keep holding at five minutes,” he said, for lack of anything better. “End transmission.” He then blanked the screen because the first of the computer-guided trains were shooting through the human areas of the ring station. They didn’t stop. They raced on to the Daimong area, where the most powerful ships were concentrated in the heavy squadron, and then began to slow. Martinez’ sleeve button gave a quiet chime. Martinez answered, and the sleeve display shifted to show Alikhan. Martinez hesitated, and glanced at his screens. The Naxids were disembarking in the Daimong areas and moving for the Daimong ships in columns thirty or forty strong, officers in the lead. They weren’t deploying in combat formations, or otherwise look as if they were going to shoot down the guards and storm the airlocks. They hadn’t showed their hand yet. It all might still have a rational explanation. And Martinez, for all the fear and adrenaline that blazed through his veins, still rather hoped it might. Now it was Alikhan’s turn to hesitate. “Very well, my lord,” he said finally. “End transmission,” Martinez said, his eyes riveted to the displays. More trains were loaded in the Naxid areas and sent out, this time to the medium squadron. The medium squadron, that had Corona as its smallest ship. In the Daimong areas, the first Naxid columns had reached the airlocks. Conversations were going on between the airlock guards and the officers leading the columns. Martinez felt his nerves coil and tense and flare. Resist, he silently urged the Daimong. Keep them off. Resist. At Bombardment of Kathung , flagship of the heavy squadron, the guards braced, stood aside, and watched as the Naxids swarmed into the airlock. Two more sets of guards, those on either side of Kathung , stood aside as they saw the Naxids enter the flagship. From the camera above Corona’s lock, Martinez saw a train slowing as it prepared to enter the nearest station. The open-topped cars were black with Naxids. Martinez switched from one camera to the next on the Daimong sections. At least six ships were being boarded. Polite conversations seemed to be going on at the other airlocks. Nowhere did Martinez see any violence. Martinez zoomed in on one of the Naxid columns. At least half the Naxids were carrying sidearms. Whatever was happening, it wasn’t a surprise inspection. You didn’t carry weapons while making an inspection. His cuff button chimed again. “Private comm: answer,” he said. Martinez configured his own sleeve display so that his words would not be transmitted: this left him free to give other orders without the Naxids overhearing through Alikhan’s comm rig. He called up the airlock display onto his command board and made certain he had the airlock commands ready. A glance at the displays showed Naxids boarding at least two more ships of the Daimong squadron. He looked at the first display, that showed the column moving with the usual Naxid scrambling haste toward Corona. The column slammed to the equally normal abrupt halt in front of the two airlock guards, and the commanding officer braced briefly to acknowledge the guards’ salutes. Only a lieutenant, Martinez saw. The senior officers were at the games, being seen on camera and maintaining the illusion that all was normal. The words came with remarkable clarity over Alikhan’s sleeve comm rig. “Does the lord lieutenant have a signed order?” Alikhan asked. Alikhan stepped back and opened the airlock before Ondakaal or his group could react. Martinez could see the Naxids quiver with the impulse to hurl themselves at the open door, but Alikhan slid it shut quickly, and the moment passed. “Shall I open the letter, my lord?” Alikhan’s voice seemed a little breathless, as if he’d run a long distance rather than just a few steps. Martinez scanned displays and didn’t see a single Daimong ship resisting the Naxid boarders. The entire heavy squadron had fallen to the Naxids without a shot. Through the camera above the airlock door he could see Ondakaal talking to Dietrich and Hong. Martinez told the display to give him audio as well as video. “I’m afraid not, my lord.” Martinez wanted to cheer, not at Dietrich’s words but at his upright, broad-shouldered stance, betraying no apology or any suggestion that he would cave to the Naxid’s demands. “I have very strict orders not to let anyone board without the permission of the officer of the watch,” Dietrich explained. Over another channel, Alikhan was reading the contents of Fanaghee’s order. It seemed genuine enough. Ondakaal continued to hector the guards. Martinez decided he’d better rescue Dietrich and Hong before they were overwhelmed, and he pressed the audio button. Ondakaal’s surprise and uncertainty kept him from observing the electric glance that passed between Hong and Dietrich, the subtle shifts in their stance as they understood his words and prepared to jump backwards for the airlock. “Buena Vista!” Martinez shouted. “Buena Vista!” And then, over the comm, he heard Alikhan’s voice shouting the words as well. Dietrich and Hong leaped backwards, out of frame. Ondakaal realized what was happening, but too late: he made a lunge forward, followed in an instant by the warrant officers behind him, but apparently Alikhan got the airlock door shut in time, because Ondakaal soon appeared in the camera frame again, and without the two Terran constables. Martinez decided to take the offensive. If he kept Ondakaal busy, he might keep the Naxid from doing anything effective. Martinez was suddenly aware that he was enjoying himself. For once, he wasn’t the provincial in the world of the privileged and self-important, or the junior lieutenant deferring to his superiors. He was playing a part, true, but it wasn’t a part dictated to him by his seniors, it was one he was inventing for himself. He was the only person within a hundred light-years who knew what was going on, and he was playing Ondakaal for a fool. And while Ondakaal was blustering about the guards’ abrupt withdrawal, Martinez dropped the volume on his outside comm and raised the one on his private channel with Alikhan. Safebreaking in the first lieutenant’s quarters. A task the nature of which should probably not be spoken aloud, not yet. “Very good, my lord,” Alikhan said. Martinez turned to Mabumba, who was watching him with awe and surmise, a combination that triggered in Martinez a pleasurable surge of vanity. Mabumba gave a start on being addressed, then turned to his console. “Countdown resumed,” he said. Martinez raised the volume on the outside comm, in time to hear Ondakaal again invoke the authority of the fleet commander and demand to be let aboard. “Fleet Commander Fanaghee has ordered an inspection of your ship,” Ondakaal said. “Outside airlock door closed,” Eruken said in a near-whisper, imitation of Mabumba’s hushed tones. Martinez put his hand over his microphone to keep Ondakaal from overhearing. “If your master weaponer has shown you the fleetcom’s order . . . ” Ondakaal was continuing. Martinez took his hand from his microphone. Ondakaal fell silent, his arms hanging at his sides in an expression of baffled defeat. He had decided to trust that the order from Fanaghee would pry open Corona’s airlock, but his posture suggested he very doubted that the order would work its magic. Martinez looked at his own displays. The Daimong ships now had Naxid guards on their airlocks, the Daimong guards withdrawn or under arrest. The displays could tell him nothing, now, that he didn’t already know. He began reconfiguring his displays for engine start and maneuver. Martinez saw Ondakaal start, then began an urgent communication with his sleeve display. Martinez couldn’t quite hear the exchange. Then Ondakaal looked up in surprise at the camera above the airlock. ” Launch? ” demanded Ondakaal. “What do you mean launch? ” Martinez cut the Naxid off. “Engines ready to fire on command,” said Mabumba. Corona was berthed nose-in to the outer rim of Magaria’s outer accelerator ring, which was rotating at nine times the speed of the planet below. The rotation of the ring supplied the centrifugal force that provided gravity to the ship. In order to unberth, the ship didn’t need to fire maneuvering thrusters: it merely had to ungrapple and allow the release of centripetal force to hurl the frigate into space. Which meant that the ship’s apparent gravity was gone. Martinez’ first indication that Corona was clear of the station was the fact that he began to float free of his couch, and discovered that he’d ignored his own zero-gee warning and failed to strap himself in. He busied himself with his harness. The gimbaled acceleration cages creaked slightly as the weight came off them. “Clear of the ring , ” Eruken reported. “Clear of Perigee. ” The berths were staggered slightly so that Corona wouldn’t be swatted out of the sky by the tail of the next ship moored to the ring, but still it was a relief to know that the danger was past. “Pilot, zero our momentum,” Martinez said. Martinez felt himself nudge gently against his restraining straps, then float free again. Eruken had killed Corona’s residual momentum, and the frigate was now hovering with the ring rotating ahead of its nose. “Ah– yes, my lord.” Diem was looking at his displays a little wild-eyed, and Martinez remembered that he was only a trainee, and hadn’t yet certified for Navigator/2nd. With himself, that made two inexperienced navigators in Command, Martinez realized. Not a good thing under the circumstances. Vonderheydte’s voice came from behind Martinez, and Martinez jumped: he’d forgotten someone was back there. Ear-blasting alarms whooped out, wailing up and down the scale. Personnel had been killed for not getting into their acceleration couches in time, and Martinez wanted to give them as much warning as possible. The alarm faded, leaving a gaping silence in its wake. Diem was looking over the navigation plot with what looked like growing desperation, while Eruken gazed at his controls and gnawed his lip. Mabumba cast a glance over his shoulder at Martinez, and his gaze seemed to center on the pistol that lay near-weightless against his thigh. None of them, Martinez realized, knew what was going on. Nor did anyone else on the ship. “Comm: general announcement,” he said, and when he spoke again he heard his own voice echo back to him from the ship’s public address system. Well, Martinez thought, that took care of the facts. But somehow he felt the deep inadequacy of his words. A really great leader, he thought, would make an inspiring speech at this point, would fire the crew to their utmost exertions and win their undying loyalty through the eloquence of his words. He wondered if he, Gareth Martinez, could ever be such a leader. What the hell, he thought. It seemed worth finding out. Well this is cheerful, he thought in the deep silence that followed. He had better strew a bit of hope in the crew’s path before they all committed suicide or vowed to join the mutineers. He wanted to cringe into his seat as he brought the transmission to an end, and he felt his skin flush with mortification. Whatever had possessed him to end with that ghastly sports metaphor? This wasn’t eloquence, this was some kind of hideous, hackneyed cant that deserved nothing from the crouchbacks but derision. He should have made his announcement about the rebellion and then just shut up. But as he looked around the control room, he saw that it seemed to have gone all right. Mabumba was looking at his displays with what seemed genuine resolve instead of casting covert glances at Martinez’ gun. Eruken had straightened in his chair and was holding the thruster controls with determination. Even Tracy and Clarke– who had little to do, really, but gaze at their radar plots– seemed more intent on their work, and Kelly, who as weapons officer had even less to do, looked positively cheerful. Only Diem was unhappy, but then Diem was probably transfixed by horror at the navigation plot Martinez had given him and hadn’t heard a word. Perhaps the crew had lower standards for oratory than the Master of Rhetoric at Martinez’ old academy. Martinez’ sleeve display chimed, and he answered. The display showed, not Alikhan’s face, but the gaping front of Koslowski’s safe, with the door removed. Panic began to stroke Martinez’ nerves with feathery fingers. The Fleet had wisely made it impossible for a junior lieutenant such as himself to discharge Corona’s awesome weaponry on his own initiative. The captain and each of the lieutenants carried keys with codes to unlock the frigate’s weapons, but no less than three of the four keys had to be turned at the same moment in order for the weapons to be fired. Even the defensive weapons, the point-defense lasers, were useless without the three keys. And the odds were that the Naxid ships were going to be firing at him very soon. For the couple hours of life that remains to us, Martinez thought. “Very good,” he said. “You’ve got two minutes.” And broke transmission. “We’ve cleared the ring,” Eruken reported. “Mark two minutes to acceleration,” Mabumba said, but Diem raised a hand, like a boy at school asking permission to leave the classroom room. In one minute, Martinez thought, I am either going to be a hero or the greatest criminal in the Fleet since Taggart of the Verity. He reached for the med injector stowed in a holster below his chair arm, and shot into his carotid a drug that would keep his blood vessels supple and help prevent stroke during high gees. The others in Command did the same. “Twenty seconds to ignition,” said Mabumba. “Engines, fire on the navplot’s mark,” said Martinez. Again the warning screeched up and down the scale. Martinez could feel his blood thunder in answer. Then a giant boot kicked him in the spine as the engines fired, and Corona was on its way.